We’re on vacation! Friday through next Sunday Adam and I have 10 glorious days off together!! We’re spending time in New Orleans and next weekend we’re doing a staycation in the city. You can tell we’re in vacation-mode because we ate 90% of our meals out of the house and with drinks and dessert and have been purchasing all of the coffees. New Orleans cold brew at Blue Bottle. Iced coffee and a chocolate croissant at L’imprimerie. Dinner at Sally Roots. Booze face. I got jerk chicken ramen! 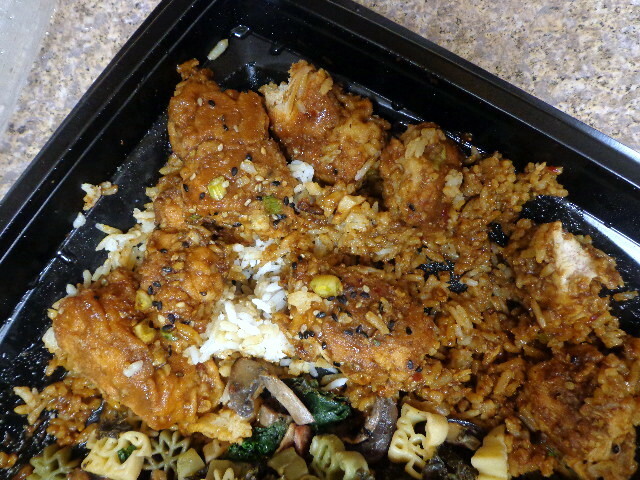 Chicken broth, yummy jerk chicken, noodles, fish cakes, bamboo, spinach, and wood ear mushroom. We did dessert at Guadalupe Inn. Drinks with meh chocolate tres leche cakes and churros stuffed with fabulous goat milk caramel. Best brunch of the year at Rider. Safe Word of the Day and Covet Thy Neighbor’s Drink. The Cure = crispy rice and lentil cakes, duck confit, cilantro, hoisin, sriracha, and poached egg. Adam had lox and fries, a combo you didn’t know how much you needed. Dessert at Odd Fellows. Crème brulee and banofee ice creams with brown butter cake crumbs on top. Pretty damn good brunch at Forrest Point. This drink was named “Fancy Pants,” Flor de Cana, Wild Turkey, Pedro Ximenez sherry, pineapple, lemon, Lapsang Souchong, star anise, cinnamon, and demerara sugar! I did manage to make some dinners at home – chicken enchilada casserole. I loosely followed this recipe from Jo Cooks, with brown rice and the addition of green chilis. With roasted zucchini on the side and chips for dipping. 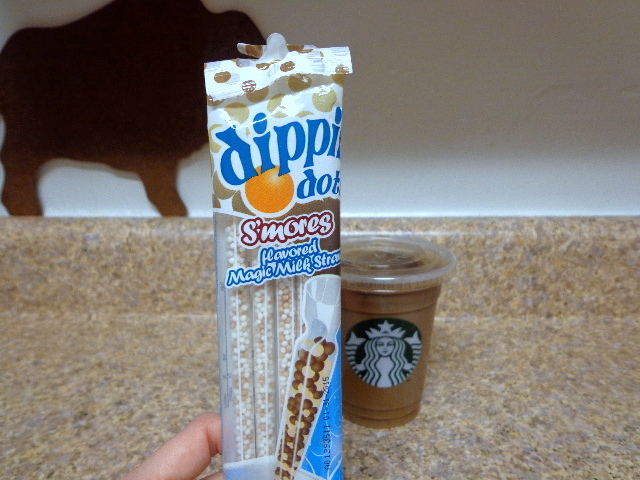 Other things that are making me happy… this assortment of cola-flavored goodies. The gum was great the seltzer was too plain. We found (freshly made) coquito at a bar in Bushwick! It tastes like coconut eggnog and joy. The Body Shop sent me this sweet holiday gift. Fantastic eyeshadow and delightful smelling things. FYI – they are offering a bunch of gift sets that will contribute to rainforest conservation, I recommend everything strawberry. Happiest thing of all? I’m on vacation! Long time no blog! Life has been busy and work has been crazy and Adam had time to spend with me last weekend so I didn’t waste a single moment on the computer. This weekend is going to be pretty exciting too… follow me on Instagram for instant updates. Speaking of Insta, do you follow @coffeecupsoftheworld? We went to the pop up exhibit in Manhattan last weekend and thought it was pretty neat. Fitting, since coffee’s been a pretty big feature of the past week. To start, the single best bites of the month. Milk Bar for an iced latte (my favorite in the city) and a Thanksgiving croissant – “stuffing” flavored bread filled with in-house roasted, shredded turkey, homemade gravy, and cranberry sauce! Adam and I swooned and were more than a little sad that we shared instead of getting one each. 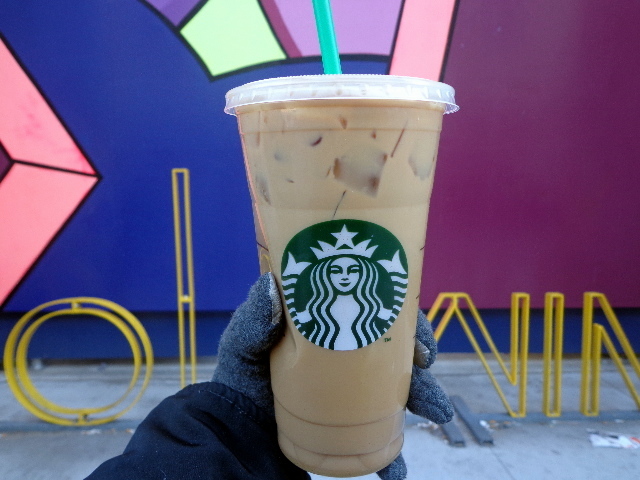 Chocolate halvah iced coffee. Better in theory but still not terrible in practice. Chocolate cherry smoothie – plain Greek yogurt, frozen cherries, vanilla almond milk, vanilla bean paste, brown sugar,cocoa nibs. Brunch at Lighthouse. With a grapefruit mimosa. We were blown away by our first chilaquiles experience, they are like a bowl full of nachos! Brown butter sprinkled chocolate chip cookies I made for a birthday party at work. I used the dough base from this recipe and they were fantastic, the little bit of crunch from the sprinkles was perfect. Ice cream from Davey’s. A Halloween candy mashup and cookie butter chocolate chip. Dinner at Ducks Eatery. I don’t have a photo of my dinner, which was undercooked and kind of gross, but the appetizer/drinks situation was breathtaking. Exhibit A – smoked mussels with chili oil on toast with maple, smoked butter, and chives. 12th st sour with egg white foam. Pièce de résistance – the Café Canard – Tullamore dew, espresso, brown sugar, cream, and nutmeg. I’m not one for hot coffee but sipping it through a cloud of sweet, foamed cream is pretty appealing. Lentil bowls. Red lentils cooked with with garlic, ginger, red bell pepper, carrot, onion, tomato paste, and turkey bacon. Topped with cheese, hot sauce, plain Greek yogurt, and a serving of roasted zucchini. Stoneridge Orchards sent me a nice package of dried fruits to try. Their products are all organic and always produced without sulfites, artificial preservatives, colors, hydrogenated oils, high fructose corn syrup, etc. Dark chocolate cherries with almonds were a work snack. P.S. that snazzy glitter sleeve is part of my ongoing campaign to make my office life more enjoyable. Fancy glass water bottle and a felt succulent. The rest of the berries were paired with toasted nuts and roasted things for some “it still feels like fall” dinners. 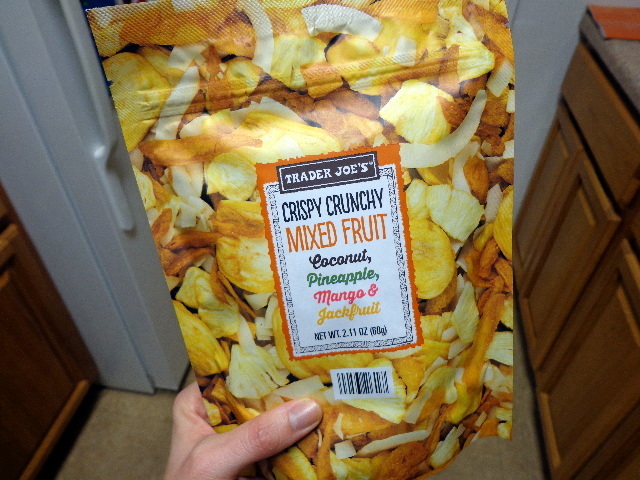 10 out of 10 for this product review, by the way, these were by far the best dried fruits I’ve ever eaten. Sometimes dried cranberries can be displeasingly chewy but the texture here was quite pleasant. Warm kale salad – sauteed kale / dried blueberries / pepitas / turkey bacon / honey thyme balsamic vinaigrette. Cranberry almond chicken salad – shredded chicken breast / mayo / stone ground mustard / dried cranberries / slivered almonds. The sweetness of the cranberries was perfect with the mustard. Roasted vegetable medley – butternut squash / shredded brussel sprouts / dried cherries / pecans / more vinaigrette / topped with goat cheese. I’m off to enjoy a long weekend! No traditional weekend for me, my only day off was Thursday. I’m actually working straight through this Thursday – 7 days in a row – which means next weekend will be a three-day extravaganza! It’s hard to complain about 7 days anyway, my last year at Buff State when I was doing school/internship/part-time job there were a few stretches where I went 30 days plus without a true day off. Key lime cookie from Schmackary’s. With white chocolate, pistachios, and cream cheese icing. 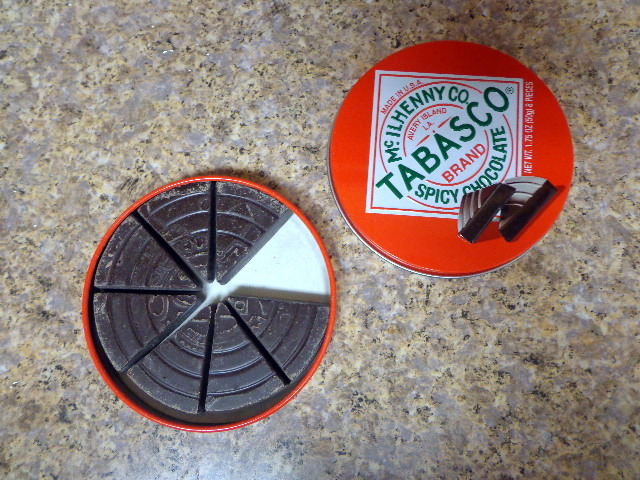 The middle is the best part. Three new dark chocolate flavors of Nonni’s Almond THINaddictives* – Dark Chocolate Banana Almond, Dark Chocolate Cherry Almond, and Double Dark Chocolate Almond. FYI – hit up their Facebook page for a new flavors giveaway. They are 70-80 calories per pack (2 thins) and crisp but not too crumbly. 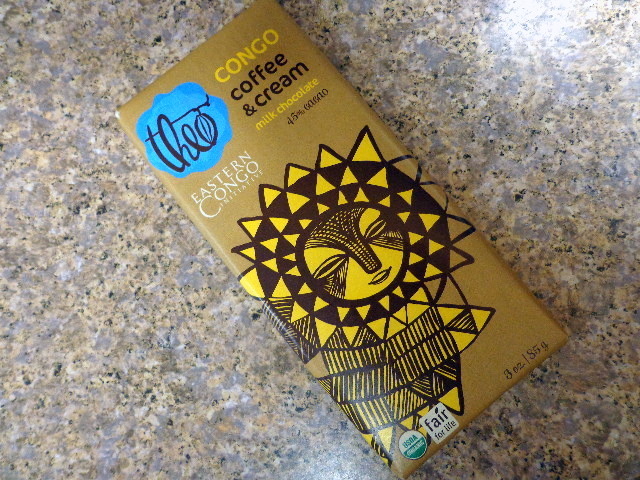 I though the double chocolate flavor was a bit plain but the cherry and banana had great notes of tart and sweet. This week I paired them with my coffee but I’m also looking forward to crumbling them into yogurts. That combo is killer, Grady’s is thick and sweet and it makes my heart sing. The cafeteria is pretty grim over the weekend but Friday I did eat this seafood feast. Fried shrimp, potato wedges, and vinegar-based cole slaw. We had leftover ice cream from our birthday party and I taught my coworkers about Australian iced coffees. Since I didn’t have my yogurt lunches I got my probiotics in the form of Health-Ade Kombucha*. Their small-batch (2.5 gallons) fizz is organic, vegan, kosher, and gluten-free. They do their fermenting in glass containers only and the bottles are fantastic and just begging to house a handful of wildflowers. Health-Ade generously sent me a case of Ginger Lemon. I have to confess here that I actually kind of hate ginger. Nonetheless, I found the kombucha to be very enjoyable. The flavor behind the spice was very “clean” and just sweet enough. I still wouldn’t buy this flavor once I finish my samples but I will damn sure scoop up Pink Lady Apple or California Grape the minute I spot them. P.S. I brought a bottle to a ginger loving friend and she said it was hands down the best kombucha she’s ever tasted. Date night in Hell’s Kitchen. My NCIS obsession finally paid off for Adam – I took us to Donna Bella Bake Shop because it’s co-owned by Pauley Perrette (aka lab tech Abby). We had a dreamy lemon bar and this delectable brownie with a cookie crust and ganache on top. We walked past Room Service and decided to do Thai for dinner. That guava mojito was terrible and weak. But the crispy duck salad wasn’t half bad. I ordered the Pad Noh Mai for dinner, shrimps, minced chicken, fresh basils, Thai chili, and bamboo shoots with herbs chili paste garlic sauce. The menu promised spice and it delivered. I wouldn’t recommend this restaurant though, Hell’s Kitchen is a bastion of excellent, authentic Thai restaurants and you can do better. I cooked! A real dinner, a stew, made of vegetables no less. I put the crock pot to work for me, filled to its brim. Onion / garlic / carrot / kale / red bell pepper / white beans / red lentils / diced tomato / veggie broth. I didn’t bother to season or brown anything so the end result was a little bland, but topped with melted cheese it was hearty and satisfying. Family time: My parents were taking a quick vacation in Philadelphia this week and I took a mini road trip and drove up to spend the day with them! I love the Magic Garden mosaics. TV: Rizzoli and Isles is on it’s final season and we have been loving it. It is the most unrealistic of the cop shows that I enjoy but it’s also very funny and heartwarming. All seasons are streaming on Hulu and I highly recommend going back to the beginning and giving it a watch. Also, the first three episodes of Documentary Now. Adam and I thought the 1st season went quickly downhill but the very first episodes are comedy gold. Coffee: the beans we bought at Birch are fantastic, even when brewed in our crappy coffee pot at home. Every time I go to Reading Terminal I hit Old City Coffee. Also in Philly, I finally tried La Columbe. I also just bought a shirt with cut outs on it, apparently that’s my summer trend. The day I visited my parents we walked around the city all day and it was just so darn hot that we ended up buying me a new outfit so I could take the world’s most refreshing shower before dinner. Coffee, duh! More cups than were shown above, obviously. Terrible picture of the yummy pecan pastries a coworker brought it. She cut back on sugar which can leave baked goods overly tough but these ended up tasting like a pastry-scone hybrid. Yogurt bowl – plain Greek with chopped red plum, granola, chia, and sprinkles. Oatmeal bowl – with dark chocolate cacao nibs, chia, and coconut butter. Plus an apple on the side. Chia pudding. The fizzy coconut water was horrible, btw. When in Philly, (chicken) cheesesteak. Dinner at Devon Seafood with my parents. Chipotle night, midweek road trips tire you out. My burrito was stuffed with chicken, pinto beans, peppers, cheese, sour cream, corn salsa, and lettuce. Best for last, the one thing I actually cooked myself! White quinoa / red lentils with lemon, tomato paste, and ginger / roasted zucchini and garlic sautéed mushrooms. I cannot believe that it is almost 2015! Doesn’t it sometimes feel like life is flying by? I hate the idea of waking up late and tired in a new year, so our big plans for NYE consist of cuddling on the couch and trying to get in bed extra early. 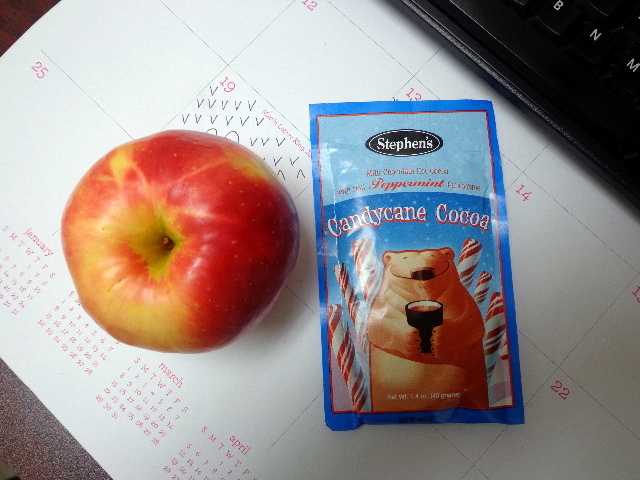 Yummy hot chocolate and an apple. After coffee, obviously. Per usual, I was all about the coffee. 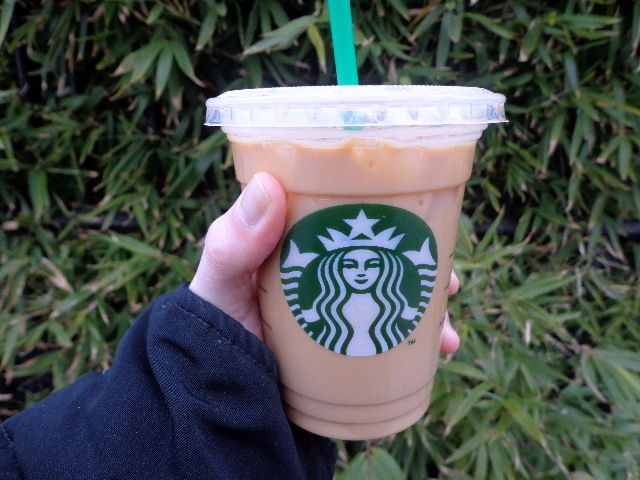 This giant (I had a freebie) was an iced vanilla latte with extra espresso. I have been weirdly obsessed with vanilla all week and it’s making me kind of crazy; I don’t even like vanilla! You’ll see Greek and frozen vanilla yogurts below, and I’m pretty much going to die if I don’t find pudding this weekend. Hopefully this craving will pass soon. 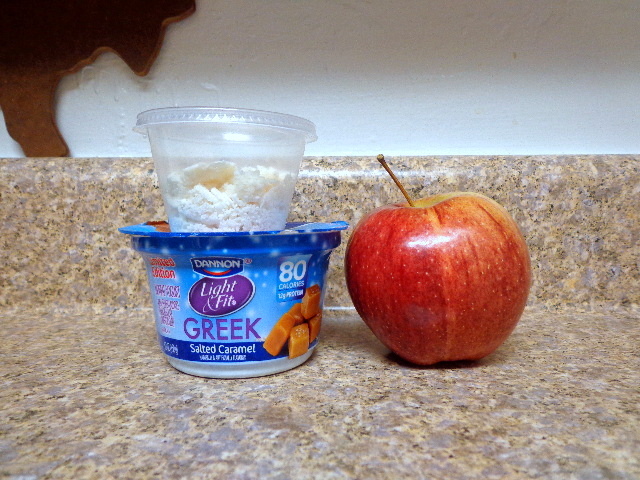 Salted caramel Greek yogurt with coconut butter and an apple on the side. 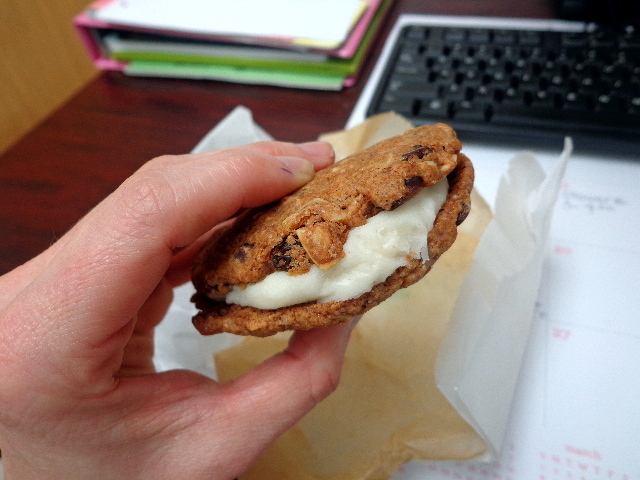 Plus a vegan monster cookie sandwich from Babycakes. <– amaze! 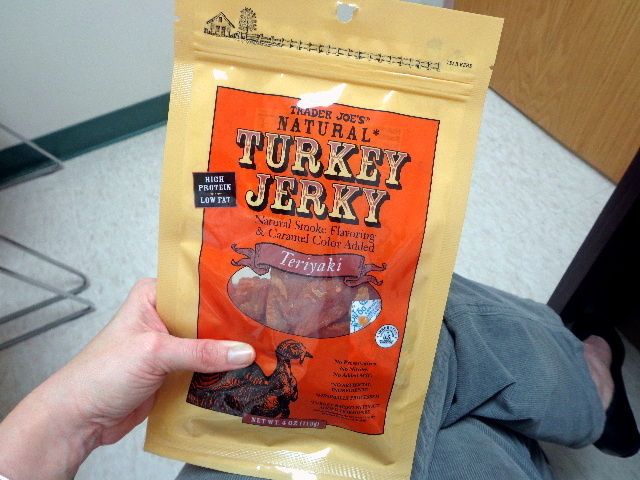 And some jerky while I did my charting. Tuesday I got lunch from the cafeteria that tasted better than it looked. A strange Caesar pasta salad (it was chicken and dressing with pasta AND croutons?!) 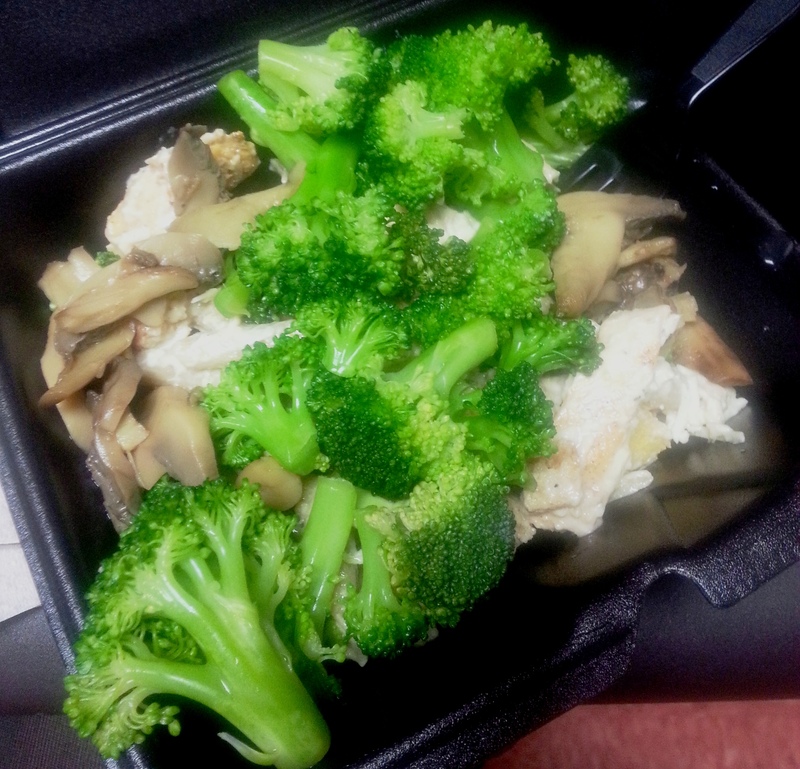 topped with mushrooms and broccoli from the salad bar. Another day I brought in dinner leftovers. 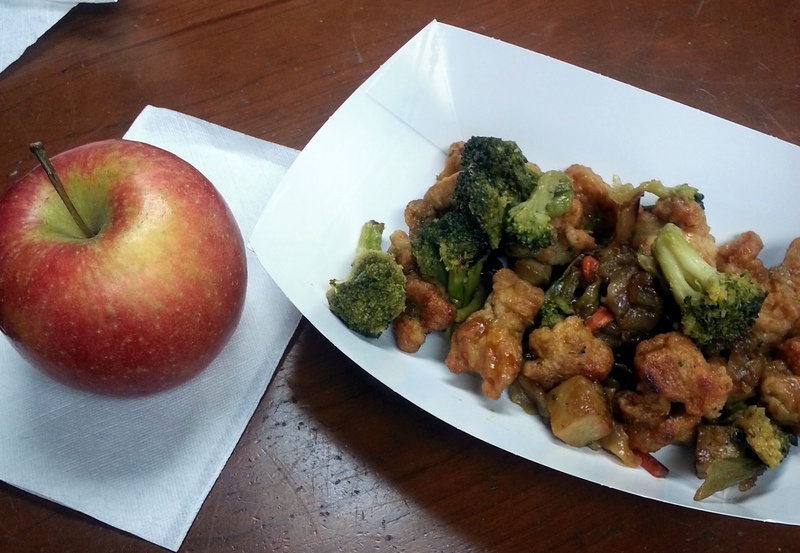 Apple on the side; I had SweeTango and Kiku this week and both were great. Sorry, Mom, this Christmas gift was too spicy. Adam is now as obsessed with this fruit mix as I am. But no one is as obsessed with vanilla as I am currently! 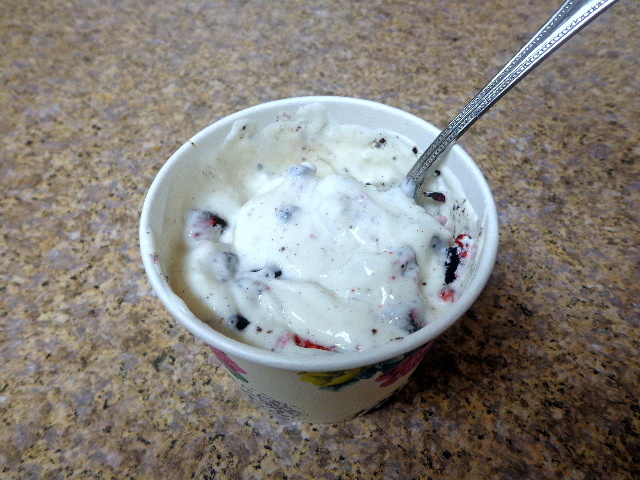 Vanilla bean yogurt with some candy cane Oreos crushed in it. 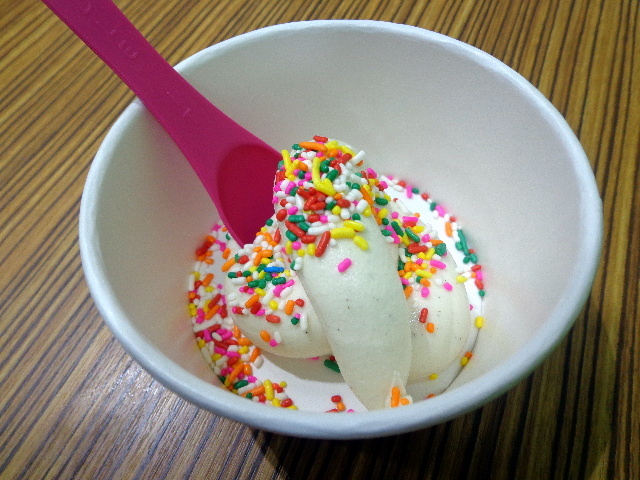 And vanilla frozen yogurt with sprinkles. This was literally the first time I’ve even ever tasted vanilla froyo. Who orders vanilla?! But today I looooved it. 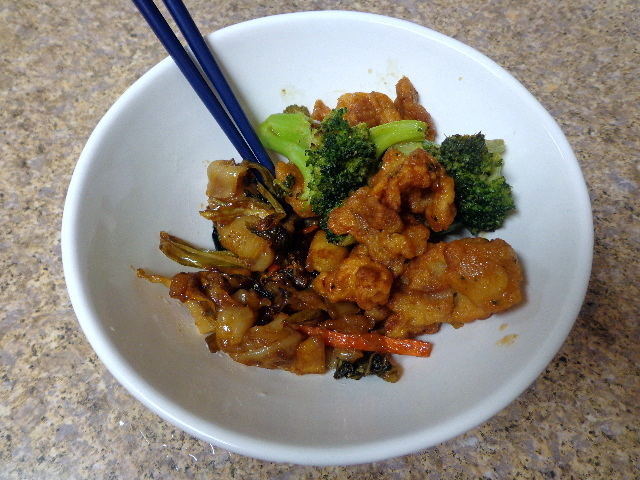 A dinner in three parts – (1) Leftover, cold, spicy cashew chicken straight from the container. 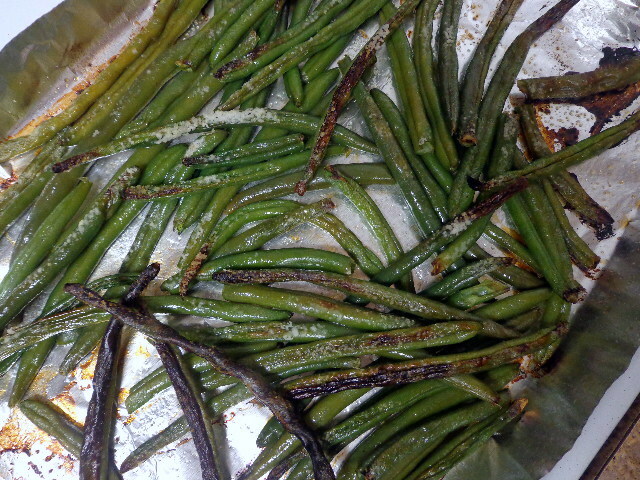 (2) A tray of roasted green beans with truffle salt. I have been finding green beans to be particularly buttery tasting lately. 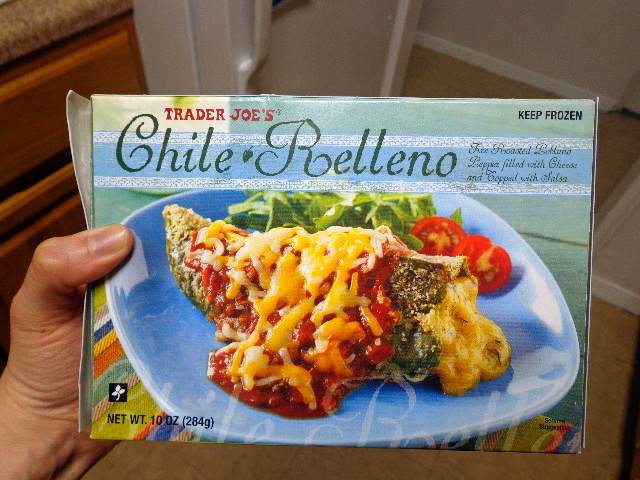 And finally, (3) a chile relleno from Trader Joe’s. 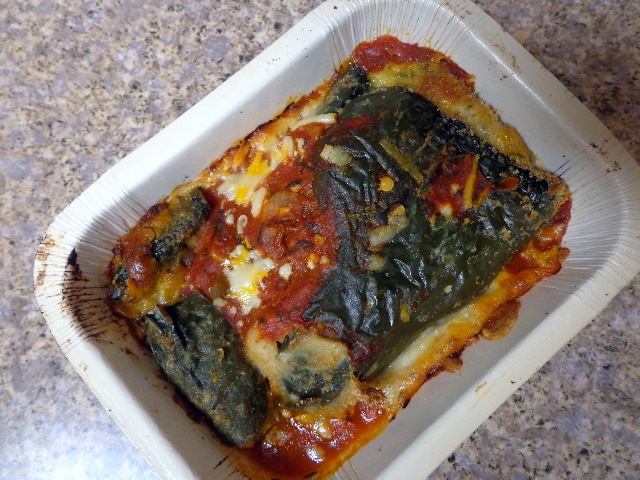 The chile looks a little rough but it was so yummy; cheesy without being too heavy. We went with the TJ’s freezer section the next night as well. 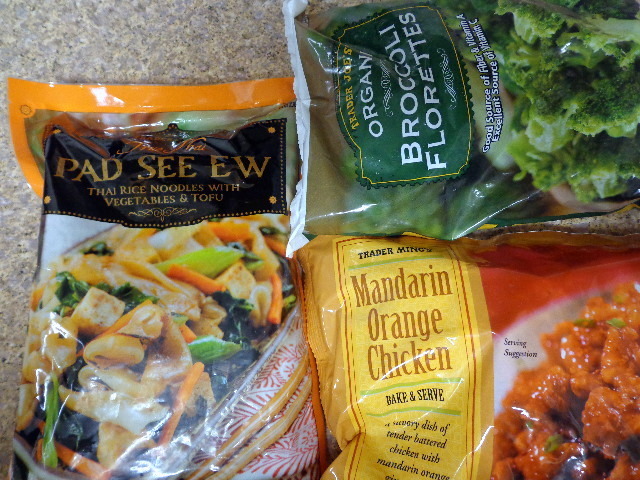 Pad See Ew and orange chicken with broccoli. We wouldn’t get the chicken again, but years ago we had the vegan version of it and loved it. Tonight we were supposed to eat lentils with broccoli and coconut rice. That bowl is in the garbage. 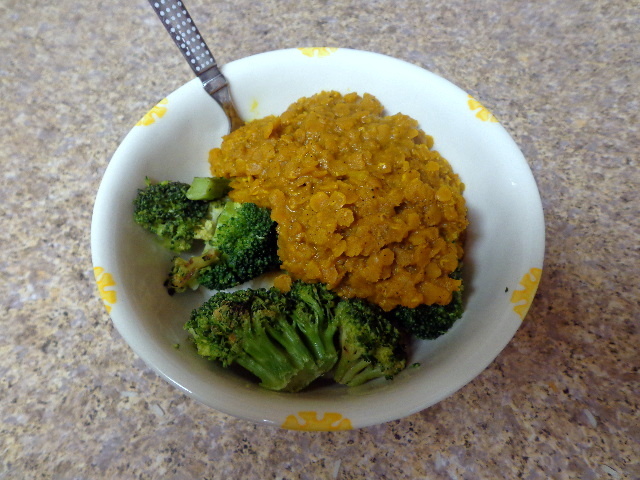 Apparently I have forgotten how to cook lentils that don’t taste like dirt. It looks like I’ll be ending the year with take-out instead.